In the world of cosmetic dentistry, there could be no treatment as sought after as veneers. However, getting veneers isn’t something you decide on a whim. You may have been recommended by your dentist to have your smile fixed with the help of veneers or maybe you’ve convinced yourself that you do need the treatment, but below are just some of the things you need to consider before you get dental veneers. You can’t hurry porcelain veneers. The thing about porcelain veneers, as opposed to composite resin veneers, is that they require at least two appointments to the dentist before your teeth can be completely treated. The reason for this is because the porcelain veneer has to be fabricated prior to it being cemented into place. A laboratory technician has to make the veneer in between visits. This means that if you are trying to improve your smile by the time you walk down the aisle or attend a very important formal party, then you need to set an appointment with your dentist well in advance. Porcelain veneers can destroy your teeth. 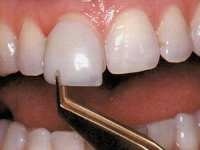 In order for your tooth to accommodate the porcelain veneer, your tooth has to be shaved down considerable or else the veneer would be sticking out. And because the enamel layer of your teeth is the one which protects the inner layers from becoming exposed, and, consequently, getting irritated, then this also means that a tooth which is to receive its veneer would become weakened in the process. So if a treated tooth loses its veneer, then this means that the very same tooth has to receive a veneer right away to prevent the tooth from being infected. Porcelain veneers are expensive but they last longer than composite resin veneers. In the same manner that you do not mind paying for a coat which you know you will use so many times throughout your lifetime, you’ll find that paying for an expensive porcelain veneer is practical despite its price tag because of the fact that the veneer would last so much longer compared to composite resin veneers. Porcelain veneers have a lifespan of at least ten years, while composite resin veneers could chip in just a couple of years after they have been installed. So if you factor in the amount that you have to spend in order to fix the composite resin veneers, then it would be less expensive to have porcelain veneers.